Opposition 'Gaining Ground' In Ukraine? : The Two-Way The prime minister is quitting. Anti-protest laws have been repealed. Moves are being made that may give protesters amnesty. But the opposition says it will remain in the streets until the government agrees to its demands, which include new elections. 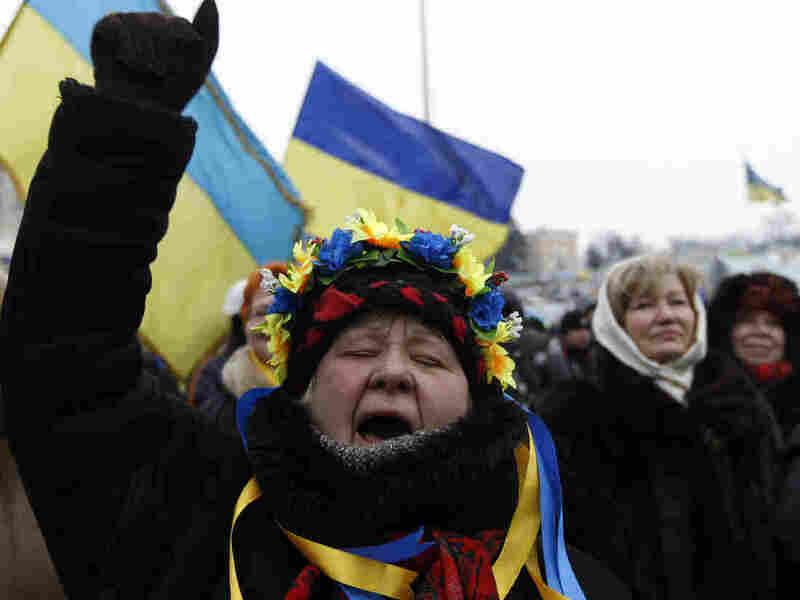 Anti-government protesters wave flags and shout slogans Tuesday in Kiev, Ukraine. Demonstrators in Kiev's main square are welcoming the news that Ukraine's "widely despised" prime minister is stepping down, that anti-protest laws have been repealed and that protesters may get amnesty, NPR's Corey Flintoff reports. The Washington Post says those are among "growing signs" that the opposition is "gaining ground in its efforts to remake the country." Still, the BBC adds, anti-government demonstrators "say they are in no hurry to leave" the streets. They continue to press for new elections and aren't satisfied with the amnesty offer — which is contingent on the end of demonstrations. The news that Prime Minister Mykola Azarov is stepping aside was not unexpected. President Viktor Yanukovych had, after all, offered Azarov's job to one of the opposition leaders earlier this week. That offer was rejected, as we've reported, because the opposition viewed it as a trick to draw them into a relatively meaningless position. But while not suprising, the news about Azarov is being welcomed because he has long been unpopular with many Ukrainians. "Azarov, who hails from Yanukovych's heartland in the Russian-speaking east of the country, and does not speak Ukrainian," has been the object of ridicule in the past, The Guardian says. In parliament last December, for example, he addressed the lawmakers in Russian "but was drowned out by chants of 'Speak Ukrainian!' and 'Resign!' by nationalist MPs." The 66-year-old Azarov, a geologist by training who graduated from Mikhail Lomonosov Moscow State University, has been prime minister since 2010. "An end to government corruption, freedom for political prisoners and for Ukraine to be aligned with the European Union, not Russia. That means Yanukovych needs to go, they insist." On Monday, Vice President Joe Biden spoke with Yanukovych. According to the White House, Biden "underscored that the U.S. condemns the use of violence by any side, and warned that declaring a state of emergency or enacting other harsh security measures would further inflame the situation and close the space for a peaceful resolution." There were clashes between protesters and security forces last week. At least two demonstrators died. The nation's justice minister has warned that she may declare a state of emergency, which might lead to a move by the Yanukovych government to clear the streets in Kiev and other cities where protests have been held.